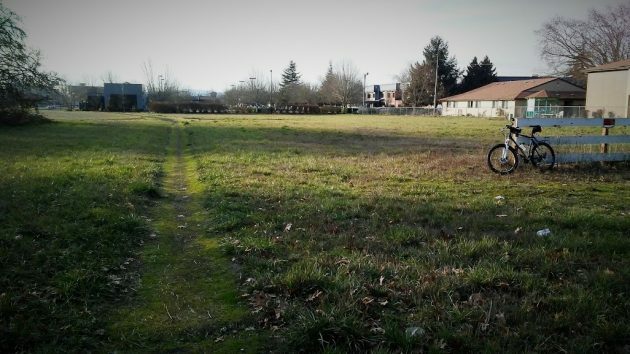 This vacant site in the 1500 block west of Waverly Drive has been approved for 96 apartments. Albany Public Library is way in the background in center right. Since housing seems to be on everybody’s mind, it may be worth noting that in 2018 Albany approved plans for 300 apartments, most recently 96 units in the Santiam Neighborhood between Waverly Drive and Davidson Street. Approvals early in the year included 132 units northwest of the roundabout on Knox Butte Road in East Albany and the 40-unit Sunset Village on Hickory Street in North Albany. Both projects are under construction. The most recent project, designated on the application simply as Albany Apartments, got the green light when the planning commission approved a conditional use permit on Dec. 3. The plans call for 96 units of one to three bedrooms each in seven separate two-story buildings, along with 164 parking spaces, the exact number required by the city. There also will be 24 parking slots for bikes. The project was designed by MacKenzie, the same Portland firm that drew the plans for Albany’s new police headquarters and main fire station. The site consists of about 4.3 acres, a vacant field of irregular shape now covered mostly with grass. It has short sections of frontage on Waverly Drive and 16th Avenue as well as Davidson Street and the cul-de-sac called Brighton Way, where Security Alarm now has its office. 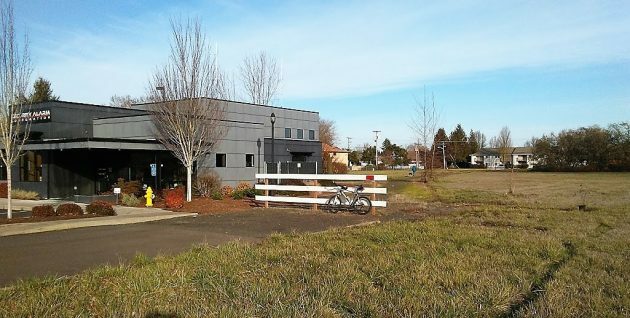 The land’s owners, based in Portland, bought the two parcels last June for $1,935,000, according to Linn County tax records. So far, the city website shows no application for a building permit, but presumably that’s just a matter of time. A view of part of the apartment site from Brighton Way on the west. The MacKenzie firm added this rendering to its application for a conditional use permit. Great to see much-needed housing being built. However, what we really need is affordable housing. There’s no doubt that all of these new places will be priced way over what is most needed. Julie, what does affordable mean to you? I am asking sincerely, not facetiously. Julie, I just don’t see how you have “affordable” housing with the entire public sector liability on the back of your housing inventory. Measure 50 put safeguards into place in order to avoid large amounts of debt that a community couldn’t afford, but Measure 56 pushed aside those safeguards, previously not voting was a “no” vote against more debt, now not voting is basically a “yes” vote for more debt, our voting turn out is extremely low. In essence what the change has done is made it easy(ier) for the public sector to meet funding needs without looking at other options, it is almost a guaranteed success, but it has a cost. The same folks that are advocates for affordable housing are the ones that just voted $180 mil. of debt on the back of the housing inventory. Add in the tax increases, based on 3% compounding per year beginning from the 1998 values, the Urban Growth Boundaries, that creates additional scarcity, and the fact Oregon is one of the top destination states and this is what it is. Frank Morse tried to overhaul the tax structure, but there just isn’t the political will to do it. So, what we have is; you get a break when you go to Wal-Mart and purchase a new TV from China (no tax), but you pay for it on the back of your home. It’s not cheap hiring people to be police officers or fire fighters, people that make the water and sewers function. Most people don’t want to do those jobs or don’t have the skill sets to do them. I’m sure these folks would rather be fishing than cleaning sewers under the streets or answering calls at 2:00 a.m. dealing with people on controlled substances. They want to be paid and their only source of revenue is some franchise fees and taxes on the back of your private property. Based on the last estimates there are over 4000 housing challenged people in Albany. Even with these new units, there’s still going to be a massive number of people that will not be able to afford housing. The rub of this whole situation is that the taxes that are charged on these new units will not even pay for the city, school and county services that will be required to service them. It’s going to cost those living here even more as those additional costs are spread across the community, and those that can’t get into a unit, will find it even more difficult. This is one of the reasons they’re spending so much time on ADU’s, they’re trying to come up with any type of solution. I’m not sure but that the only solution may be the supply and demand curve, there’s just many more people that would like to live in Oregon (and Albany) than supply will allow, especially when you add in all the services that are being supplied and expected. City services are not ala carte. Very true, and while these (and more to come) may be but “a drop in the bucket” to the total needs over time, many of these “drops” can also help mitigate that need. You’re also very correct in that any/all services are paid for by all the taxpayers – even those looking for entrée into housing. I do not know how that will change..
It’s going to be a challenge to figure out, if it’s even possible. People like services and once they have them they don’t like giving them up, but you have a large segment of the population that’s in dire need and really can’t afford these services, that’s a tough position for our local government to be in. Our CC, city, county and these boards are going to have to figure this out some how and still be in compliance with the state, who is also trying to figure it out. It’s easy to point out the problem, the solutions are painful. Corvallis already has claim to the Apartment City tag.